I feel like a love of books and a love for scrabble go hand in hand. I don't think I've ever met someone who loves to read, but doesn't like to play Scrabble. I'd be lying if I said I didn't love all board games, but one of my top favourites is without a doubt, Scrabble. I will gladly play anyone willing - in person and on my phone. Actually, my lack of blogging as of late can be partly contributed to my obsessive playing of Words With Friends (Scrabble copy-cat) on my phone. In 3D life, my favourite person to play Scrabble with is my sister-in-law, Patty. We both share an equal passion for the game. It's hard to beat her and I love the challenge. Plus, she doesn't cheat to win. I hate cheaters. What's the point? It doesn't even look like it has ever been played! When I saw these on the shelf I grabbed them so fast and held them to my chest, looking out the corner of my eye at the lady scanning the shelves next to me like, "THEY'RE MINE, THEY'RE MINE! I SAW THEM FIRST". Pretty sure she thought I was more than a little crazy. I actually don't know if these are considered *vintage*, but come on - I didn't even know such versions of my favourite game existed! The boxes are a little banged up, but the pieces don't look like they've ever been used. And they were just 3 dollars a piece! Now I just need someone to play them with. Jim actually said he'd play them with me, but I think he just felt bad telling me no after I came home and proudly showed them to him, excitedly asking him "WILL YOU PLAY WITH ME, WILL YOU!?" 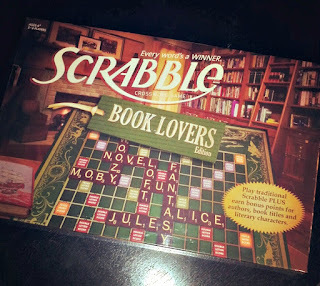 Sadly, my Book Lovers Scrabble (which was a wedding present from my bookstore manager - an awesome present I might add), has never been played yet either. 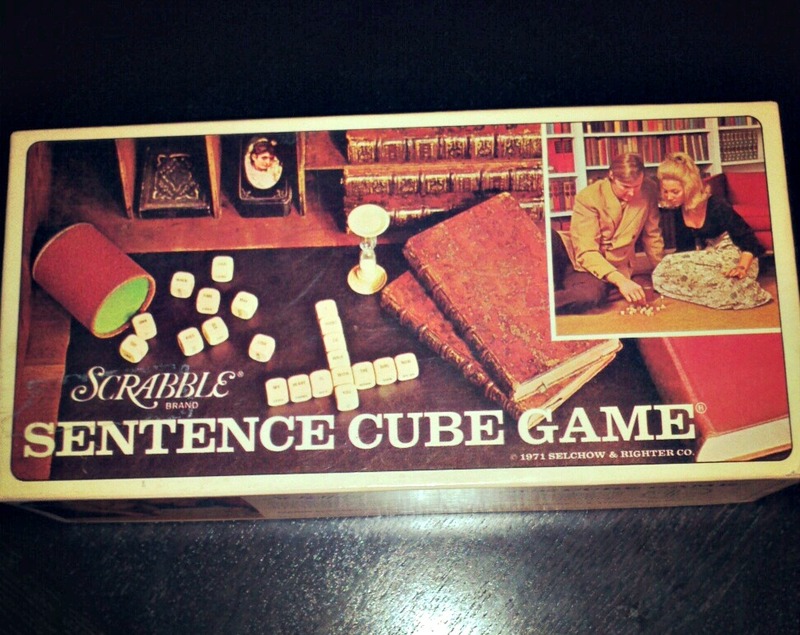 So, who wants to come over and play Scrabble? I'm finding it frustrating because I have all these words to put down but theres no where they fit and once I see a word, I don't see anything else.... that and I don't have any kind of strategy..., Oh, and when I do put a word down, it never fits onto the extra points..,. I think I enjoy watching more.... same as every other kind of game. I'll play Scrabble with you Brie! And that sentence one looks very cool, plus I love the 70's colours. They totally remind me of my parents' camper. I'm not great at Scrabble, but I've had some excellent tutors. My mom and aunt (and my Granny when she was still around) would have some EPIC matches. I remember there was always a lot of gloating at the end. Yay - game on!! And I agree - I love the retro vibe and colors of the ones I found. Hahaha, I was so worried the lady standing next to me was going to say something like "Hey! I *was* going to look at that!". My heart was pounding so hard lol! 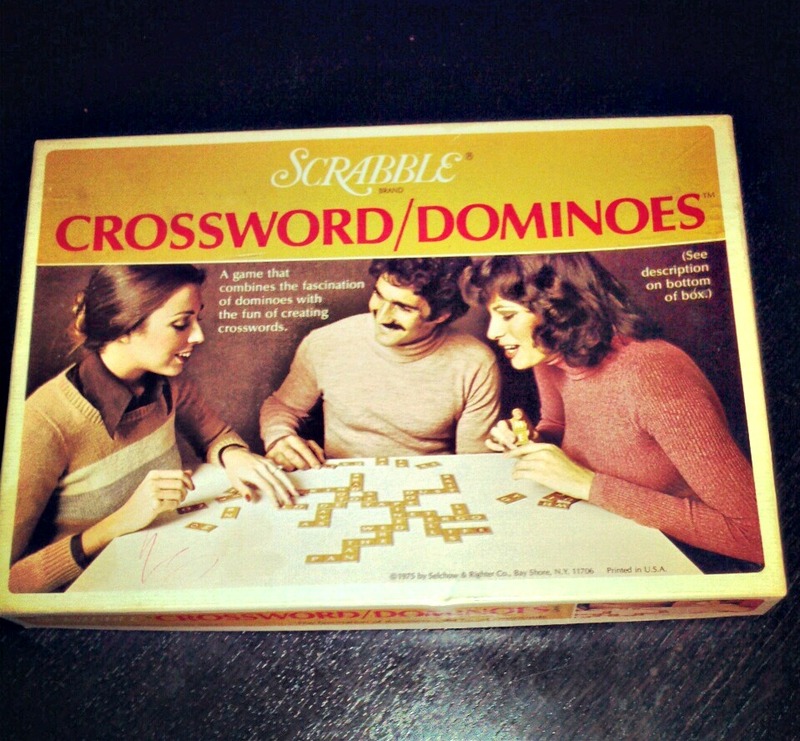 We totally need to plan a night of wine and scrabble. Did you also know there is a "Words with Friends" board game out now, too? I have no idea if the lady wanted them, but we were standing quite close together and I was so worried she was going to say something like "hey - I was going to look at those!". LOL. 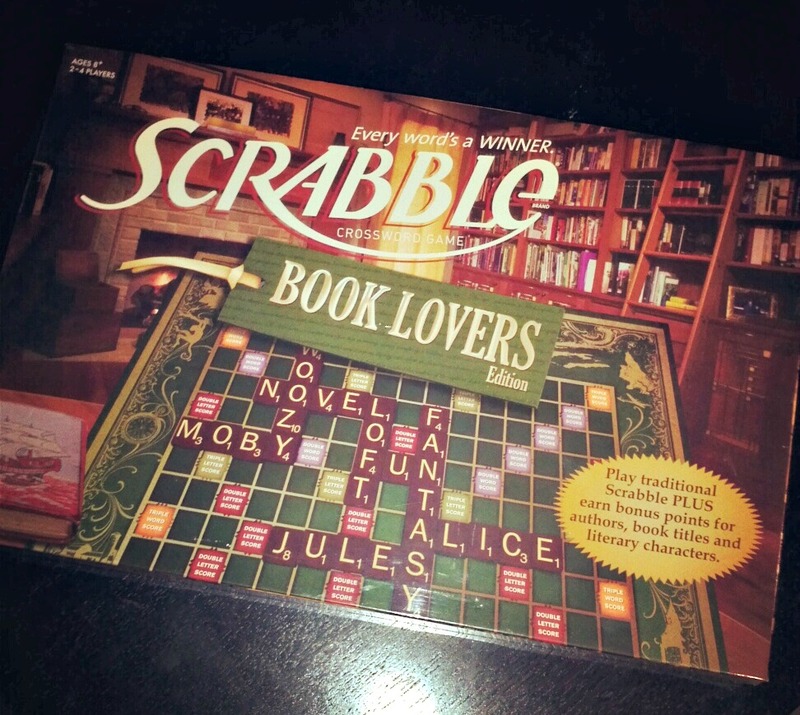 YAY for scrabble for booklovers. we are SO playing that at the get together. I agree, I hate scrabble cheaters. seriously, no one knows the words rectohigodenosarus. Hah! 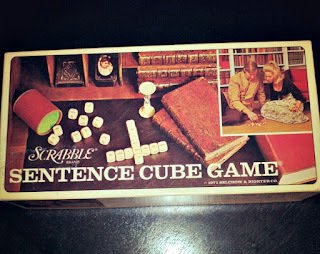 Only book/'word' lovers can get truly competitive with this game.... it shall be funny! Have you played it yet?? I admit - sometimes I try *words* on WWF just to see if it's actually a word and sometimes it is....but I don't really consider that cheating?? I've heard some people go online and cheat that way - I don't know how that works, BUT COME ON, that's so lame! I love it! I adore scrabble, though I think I do better with the online versions since I can put in something that's not a word and I don't get points deducted or anything. I'm a HUGE guesser when I'm trying to play! But I love these classics ... that's awesome that you found them! I do this too! I'm totally guilty of trying random letters hoping it might be a word...but I don't *really* consider that cheating. It's usually cause I can't make a word with my current letters. But I've heard people actually go online and cheat which is SO LAME. I want to play!! 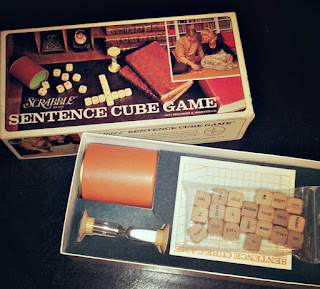 I have been a Scrabble lover since I learned to spell. I too would play with my Great Grandmother, Grandmother and Mother. The day I beat my Grandmother I was absolutely elated. No other win since has been the same. Sadly, these women are no longer with me but they instilled the love of the game in me. My family has nicknamed me "Chuck Norris" of Scrabble :-) I love playing most with my sisters as they are always great contenders. I prefer a real board than the online/phone versions,I own 4 boards. I had to stop playing on my phone because it was taking over my life and it was too tempting to play while I was at work. I also find more cheating while playing the online versions too which is annoying. I have such fond memories of playing Scrabble with my in-laws (before we were married) in the summer in their backyard, and then playing with my parents during the holidays. It's such a fun game and I wish we took the time to play it more frequently. :) I'm so glad you shared these! It made me so happy and super nostalgic too.